Jacques isn’t looking too good. Believe me, this is not his normal. I think he’s a little subdued because we went to the new vet today. I think maybe his rabies shot has him a little down. Or maybe he just misses his old vet. His first vet was great fun, stylish, charming and terrific with Jacques. She was, no question, the Paris vet from Central Casting. I’d have gone to her forever but we moved halfway across town, so that was that. This new vet is no fun at all: no style, nothing that would pass for charm but he knows his stuff and is a bit of a health nut. I’m pretty lax, so I need to surround myself with maniacs, just to keep me more or less on track. It turns out that Jacques is allergic to Paris pollution. I start coughing every time we pull into town, so I can well believe it. “See that red hair in these paws? Does he ever chew on them? Yep, thought so. Look at these red ears. What are you feeding him?” I copped to the Orijen, thinking that might keep me from having to admit that Jacques would really rather live on table scraps, and whose fault is that??? Orijen is a Canadian brand that features no corn and all healthy ingredients. Well, that’s not good enough. Take that all you folks who laughed when you read the bag and suggested that maybe, just maybe, I was going a bit overboard. No, wrong, we were both wrong. Apparently Jacques needs either Orijen Six Fish, which he hates, or hypoallergenic kibble. I was sent home with samples. I think he’s really going to hate that stuff. After all the Brie we have been feeding him? It’s going to be a difficult transition. New Vet is a big believer in organic ingredients. Jacques also has some oil that I put between his shoulder blades, where it is absorbed, in much the same way that one applies Advantix. It smells good. I guess it’s good for his skin. Can’t hurt. We can do this for a while. Or, apparently, we could move to the country. New Vet allowed as how the Vendee was pretty clean. It’s a thought. Does the vet have shares? Shares in what? The fancy dog food? I don’t think so. I think he makes most of his money from the dog grooming place downstairs. He doesn’t sell the food he was recommending. When I asked about food he was selling, he said no, try this other stuff. He was an odd guy but his assistants liked him and he was totally focused on Jacques. Short answer is no, I think he’s a true believer. But you can’t go rural, your man has commitments does he not? As for the right food , you like to cook so maybe? He runs the shop. He can do anything he wants. It’s good to be king. So I looked at that cookbook. Believe me, I thought of cooking for the little one right away. It looks good but not like you could feed him only that. I have noticed that many of these “cook for your dog” recipes are really just ways to supplement kibble, which doesn’t interest me very much. I found another book, “What’s for Dinner, Dexter?” I forget the rest of the title but it is written by a vet and is based on theories of traditional Chinese medicine. Now that’s for me. I’m sure Jacques will be happy to give it a try. Anything but bland food. I saw an amazing dog cook book someplace last year but I can’t remember what it was called. The theory behind the food & balancing meals seemed well researched and sound to me. Hmm. Maybe. We shall see. Yes, move to the country, visit the city. That was Plan A. We may still get there. The resident French guy is not wanting to hang pictures, etc., in the new apartment. We have the typical three-year lease and that about corresponds with his planned retirement date. So, you know, we shall see. I know Jacques would like it. What will happen will happen and so long as you are happy and content that is what counts most. I have given up trying to predict when we will be settled in our final home – it’s far too draining and I miss too much of life worrying about the what ifs and when ifs. Bon courage to you – there are far worse fates than Paris!! Final home? I’m on my fourth one, now. I guess plans, as well as promises, are made to be broken. I don’t know that I have the energy for a fifth go at this, so I do hope it works out. Owie. That’s tough. Just not being able to settle for the past three years has been difficult. Hope you find something soon, even if you can’t exactly nest for a while. Not easy but not near as hard as what many have to deal with. One fine day I’ll be settled and then let the party commence!!! That’s for sure. You just reminded me, it’s time for a refugee update. Like so many things in life, it’s complicated. I look forward to reading the update …. nothing is simple though I’m told no-one promised easy! Oh, yeah. I used to hate “Green Acres.” It horrified me that someone could be dragged away from a life she loved. And really, to a farm? These days I could take either side of the argument. In my household I have someone tugging me in each direction. Our English ‘flattie’ (that’s a flat-coated retriever) loves our holiday house in the Deux-Sevres especially the cheese scraps which have been a regular treat. 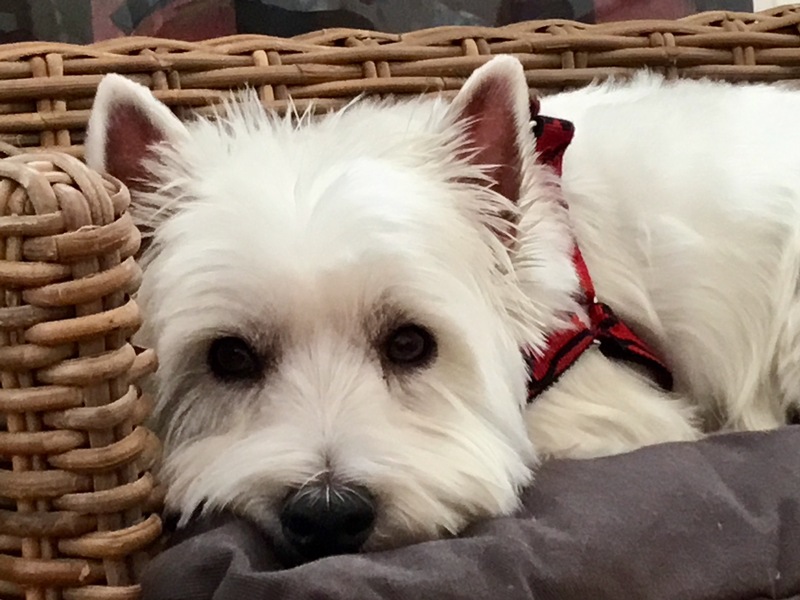 No longer – she was diagnosed as having inflammatory bowel disease in the summer and is now on a special (and very expensive) hydrolysed protein kibble, NO other food or treats except the occasional piece of apple. She is not amused – but is now in remission so maybe your vet has a point? It’s worth trying the new food anyway – I felt so guilty that poor Coco had been stoically coping with stomach cramps & gastritis and we hadn’t noticed until she had an acute episode. Good luck – he is such a gorgeous little chap. He’ll be okay. He already looks better. The redness in the ears is gone. It was all I could do to avoid rolling my eyes as the vet was applying the oil but it seems to have done the job. So tell me, is the special food forever or just until your dog’s digestive system settles down? Jacques is such a tiny thing. If his tummy is too upset, he throws up immediately; the sofa is a preferred location. It’s hard on the fabric, though it seems to be just what Jacques needs to feel better. Anyway, I have been wondering whether I can eventually go back to kibble with a little more flavor. Sadly, yes, Coco is on the special kibble for the rest of her life. However, she has got used to it and is tolerating the occasional apple as a treat. Ten days ago she slunk next door and wolfed down the cat food our neighbours had left outside for their cats – naughty girl. However, it was an interesting if unplanned experiment; sure enough, within 12 hours she was vomiting and again showing blood in the product at the other end. After tummy-settling medication and starving her for 24 hours she is just fine but the episode proved that she definitely has a sensitive gut and our vet is correct – she has to stick with the Rolls-Royce of dog food. On the positive side, her coat has improved enormously – back to the old glossy, silky fur, and her energy levels also back to normal – and she is maintaining a healthy weight. Guess we shall just have to eat all the cheese ourselves….. I think we got lucky. So far we have just stopped the treats. That seems to be doing the job. I live in hope. If we can get away with the Mercedes kibble, rather than the Rolls Royce, that will be a good thing.